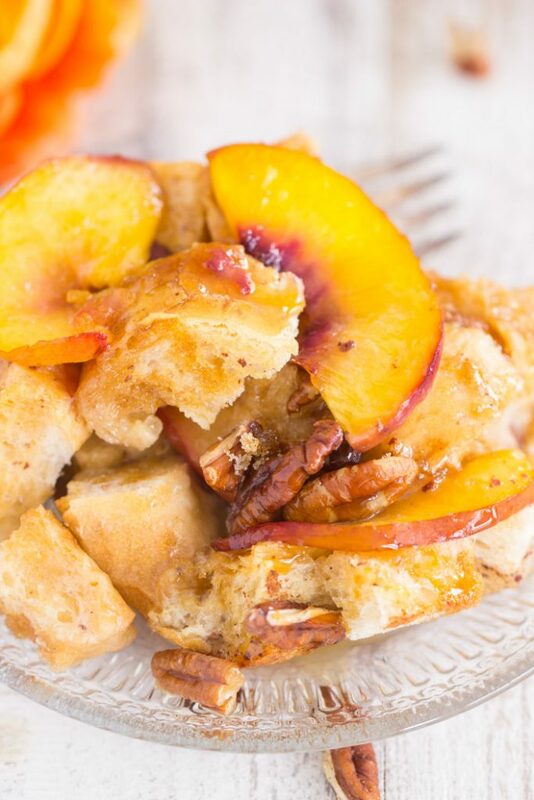 With simple ingredients, and quick-to-prep, this baked Caramel Pecan Peach French Toast Casserole bursts with fresh peaches, crunchy pecans, and caramel flavor! 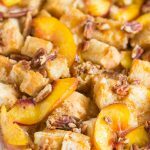 You’ll love this combo of flavors, and you’ll live for weekend brunch when you try this Caramel Pecan Peach French Toast Casserole recipe! Good morning! It feels good to be back! I’m sorry for the unexpected absence the last week or so! Suffice to say, our schedule for fall looks different than I expected it to, and we’re adjusting to that. I don’t even have kids, but the end of summer can bring about a different agenda in my household too, and we’re trying to get through calendar and schedule changes as seamlessly as possible! I can’t imagine what it’s like if you’ve got kids to finagle too, and their packed agendas! I have several work trips coming up, and we also took an unplanned trip up north at the last minute (thanks, Irma), and so we’ve been thrown for a loop. Labor Day weekend was in the mix, and then the holidays are coming up faster than I can even believe. Even without kids to send ‘back-to-school’, we still end up with our own grown-up version of back-to-school with the change in seasons. With our schedules being crazy and chaotic, I have to say… I picked up several Silk® Shelf-Stable products at Walmart last week, and I’ve never been more grateful to have those on hand. They really saved us. The convenience of not having to refrigerate the Silk® Shelf-Stable products is HUGE. 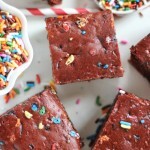 If I can’t get to the store for groceries, these are amazing to keep stocked in your pantry. 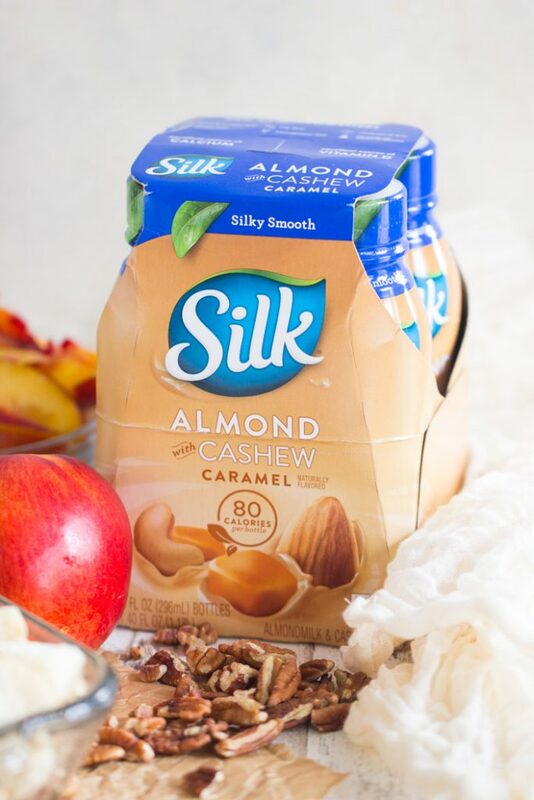 I picked up a 4-pack package of Silk® Almondmilk and Cashewmilk with Caramel Bottles, as well as a 4-pack of Silk® Unsweetened Vanilla Almondmilk Bottles. Both varieties are shelf stable and require no refrigeration until you open them. You can also find Silk® Single Serve in the shelf stable milk aisle, and those are really handy too since they’re already portioned out. Of course, you can find great Silk® taste at the grocery store in the refrigerator section too, but there are times when it’s exceptionally convenient to have bottles that don’t need to be refrigerated. Silk® Shelf-Stable products are a delicious way to stock up, and believe me, you’ll appreciate their convenience. These are so delicious. 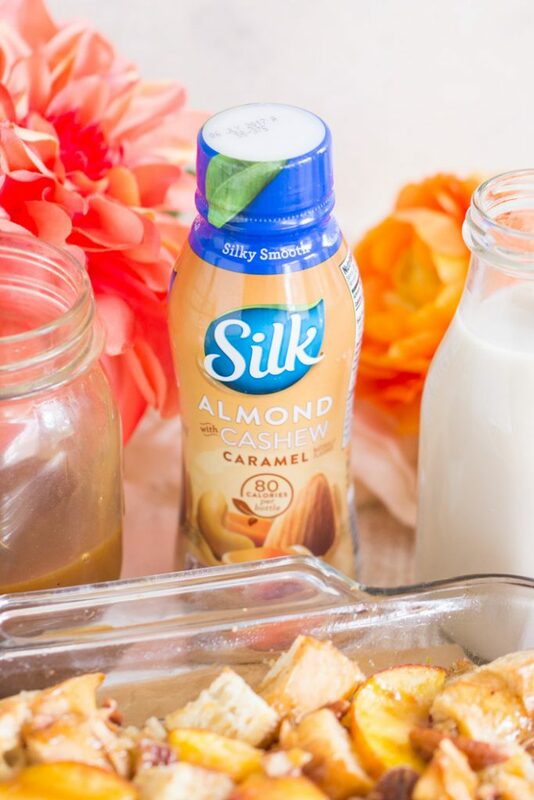 I love how flavorful the Silk® Almondmilk and Cashewmilk with Caramel variety is, and all the varieties boast a fresh taste, minus the fridge! 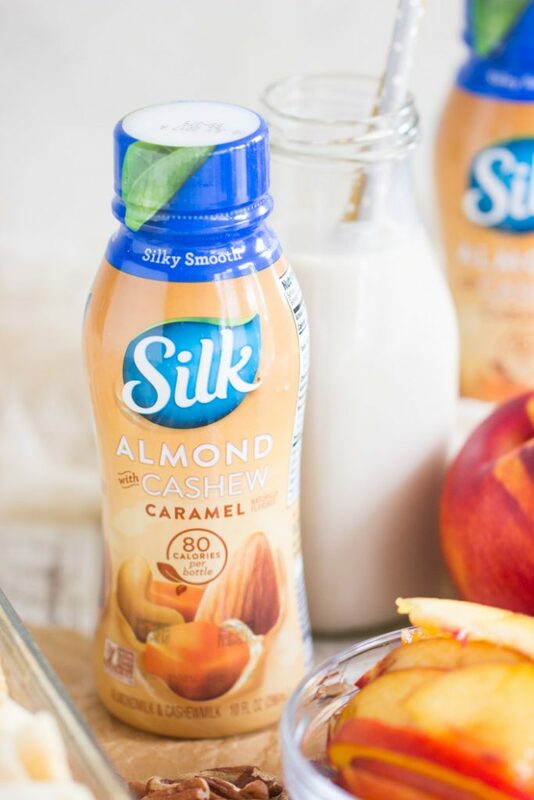 The Silk® Almondmilk and Cashewmilk with Caramel has a wonderful nutty flavor with a touch of caramel. They’re an excellent source of calcium, 100% cholesterol-free, contain no saturated fat, are free of dairy, lactose, gluten, casein, egg, MSG, and artificial colors and flavors. I can’t tell you how much the Silk® Shelf-Stable simplifies our lives. If I’m craving a bowl of cereal, but I haven’t had time to get to the grocery store, I can grab Silk® Shelf-Stable from the pantry. Or I just want something creamy to drink or to add to my coffee. Or I’m in the middle of a recipe, and I don’t have anything in the fridge! 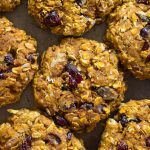 Silk® Shelf-Stable is fantastic in recipes – it works seamlessly and beautifully in many baked goods! On top of that, the bottles are a great size to stash in lunch coolers and to take on-the-go. 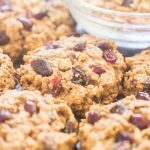 I can add it to oatmeal for a quick breakfast that gets me out the door fast in the morning. Maybe even your power is out for days on end (again: thanks, Irma!)! You will really want to ensure that you’ve got a stash of Silk® Shelf-Stable. In Florida, we get some bad thunderstorms, and our power can go out with practically a slight breeze, so these are a life-saver. 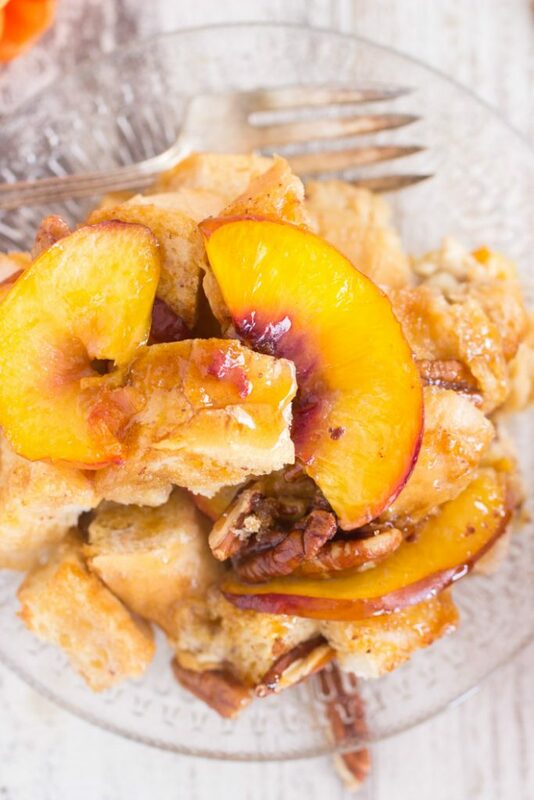 I used the Silk® Almondmilk and Cashewmilk with Caramel in this simple breakfast dish, and it added so much flavor and creaminess to the custard component of this Caramel Pecan Peach French Toast Casserole. 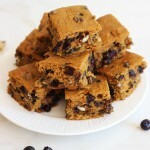 It also added nuttiness and the flavor of almonds and cashews, as well as a kiss of caramel. 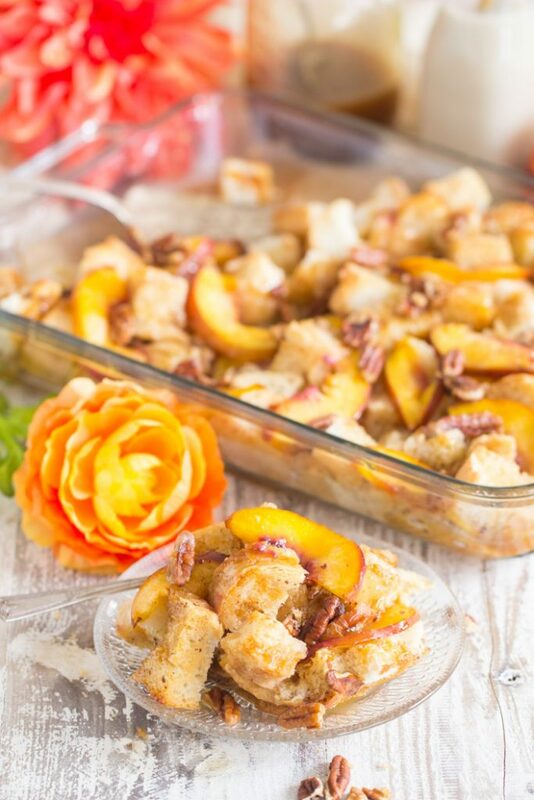 With a little brown sugar, pecans, and sliced peaches on top of this casserole before baking, the flavors all came together beautifully. It couldn’t have been easier, and it feeds a crowd! See below for a coupon for Silk® products! Spread bread cubes onto a large baking sheet in a single layer. Bake for about 10 minutes, or until bread cubes are golden and lightly toasted. Spray a 9x13-inch casserole dish with non-stick spray. Arrange the bread in the dish. 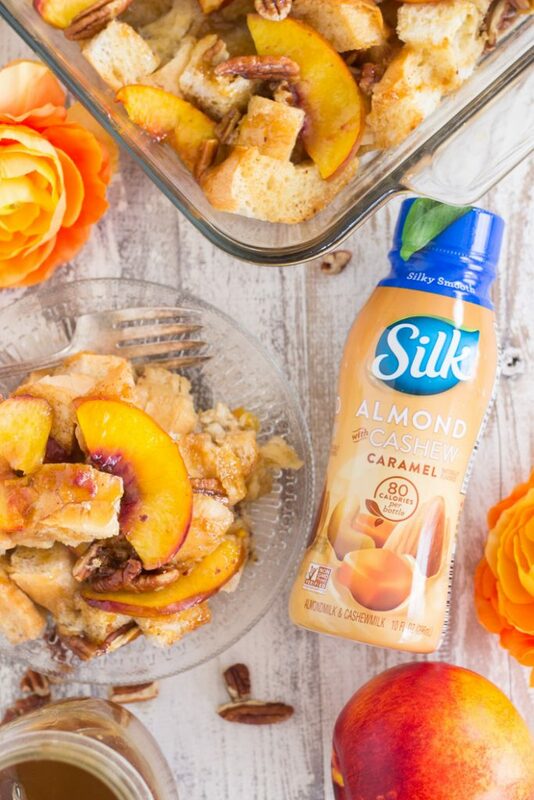 In a large bowl, whisk together eggs, Silk® Almondmilk and Cashewmilk with Caramel, sugar, vanilla, cinnamon, and nutmeg. Drizzle mixture over the bread in the casserole dish, making sure to evenly distribute. 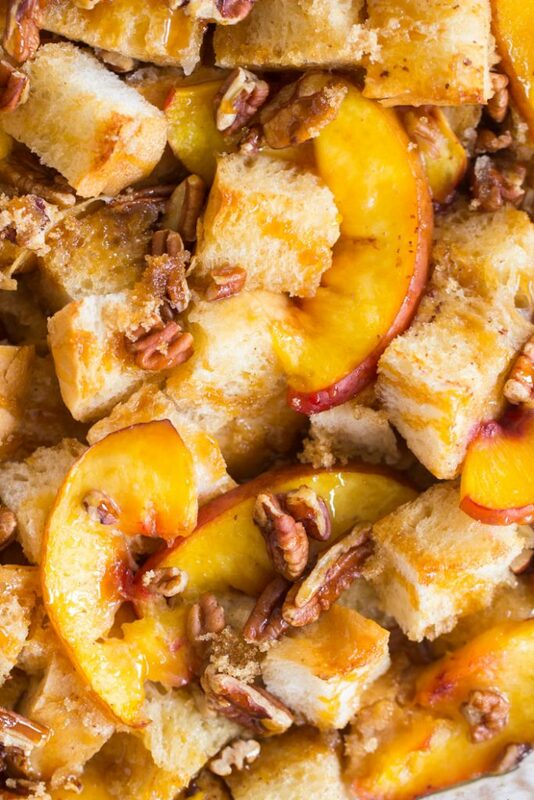 Sprinkle the casserole with pecans, peach slices, pats of butter, and brown sugar. Remove foil, and bake for an additional 10-20 minutes, or until casserole is 'set' and the top and edges are golden. 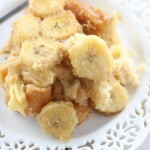 Remove from heat, and serve with caramel topping or maple syrup, or both!